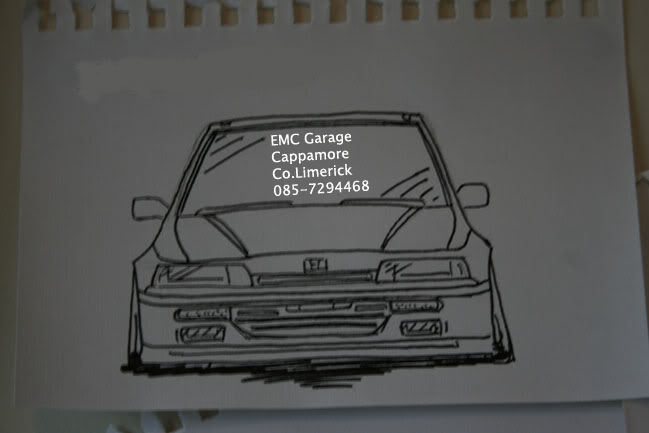 Is it only honda's ur doing or wot eoin? are you gonna sell these ?? Do you want the address and number in it? @Eg Head wrote: Do you want the address and number in it? I dont have photoshop but I might be able to draw somethin up! @Eg Head wrote: I dont have photoshop but I might be able to draw somethin up! sorry lad's but these are possibly to go on cars that he works on so they need to be simple, yet they need to stand out?? if i am getting the wrong idea then feel free to delete this. they need to be like the honda haven stickers- as in noticable yet look well?? @carthymc wrote: sorry lad's but these are possibly to go on cars that he works on so they need to be simple, yet they need to stand out?? if i am getting the wrong idea then feel free to delete this. they need to be like the honda haven stickers- as in noticable yet look well?? Well tell me what exactly you want. Something like a honda haven sticker? your name (EMC GARAGE) and then a logo or what? What about this one Eoin? ?